The concerts are over and candle-light services are nearly complete. No more caroling, food drives, corporate holiday parties and the sound of Salvation army bells are quickly fading. The world will soon say goodbye to “the holidays” and will soon pivot its attention to New Year’s and Super Bowls. The world may soon have Christmas almost in it’s rear view mirror, but for Christ’s church the wonder and joy of Christmas never ends. Isaiah prophesied that a virgin will conceive and bear a Son whose name will be Immanuel, God with us. He came to earth that day, and remains with us in every day. The Creator of the universe stepped aside from the full display of His majestic glory and dove headlong into His creation. The day Christ was born slipped by, uncelebrated throughout the world. It was not for lack of Instagram, satellite communication or weak cell phone coverage. It was not because the postal service lost His birth announcement or a webpage failed to update. Christ entered time and space as planned. The seclusion from the abusive prying eyes of the world kept King Herod from carrying out yet another satanic attempt to assassinate the Savior. Beyond the safety of our Savior, the world did not see the eternal significance of the first Christmas for the same reason that it cannot understand Christmas today. “The god of this world has blinded the minds of the unbelieving so that they might not see the light of the gospel of the glory of Christ, who is the image of God” (2 Corinthians 4:4 ). Eyes that are blind to the truth can never see the glory of the Savior who was born. The world cannot see Jesus, but the world can see Jesus in you. 1 In the way we love. Jesus said, “by this all men will know that you are My disciples, if you have love for one another” (John 13:35 ). The supernatural love of Christ flows between brothers and sisters in Christ. It’s more than a bond of unity holding our spiritual family together, it is an evangelistic love that draws unbelievers to the Savior as the source of our love. 3 In the way we forgive. Sin is inevitable. But because we are believers, forgiving others for sin should also be inevitable. The world is spring loaded for bitterness and revenge. The evangelistic shock of a forgiving heart is a clear demonstration of Christ at work in us. As Paul wrote, “be kind to one another, tender-hearted, forgiving each other, just as God in Christ also has forgiven you” (Ephesians 4:32 ). 4 In the way we serve. The life of Christ make His attitude visible for all to see. He selflessly, humbly and relentlessly served others. From washing their feet to preparing their food, no task was beneath the dignity of our Savior (Philippians 2). When we follow His example of humble service, the world will see Jesus at work in our lives. Jesus said, “let your light shine before men in such a way that they may see your good works, and glorify your Father who is in heaven” (Matthew 5:16 ). 5 In the way we speak. Our words are the window to our soul (Luke 6:45 ). They are also the window to Christ’s work in us. Beyond the example of our lives, the gospel message we proclaim is the single most important way the world will see Jesus. “How then will they call on Him in whom they have not believed? How will they believe in Him whom they have not heard? And how will they hear without a preacher?” (Romans 10:14 ). In this context, every single Christian is “the preacher.” So,“sanctify Christ as Lord in your hearts, always being ready to make a defense to everyone who asks you to give an account for the hope that is in you, yet with gentleness and reverence” (1 Peter 3:15 ). 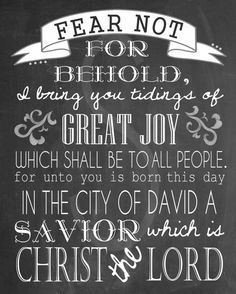 Celebrate Christmas, exalt our Savior, linger long over His word and in worship of Him. In doing so, we are “beholding as in a mirror the glory of the Lord, are being transformed into the same image from glory to glory, just as from the Lord, the Spirit” (2 Corinthians 3:18 ). Today, and every other day of the year, we live between the fulfilled promise of His birth and the anticipated promise of His return. The world may not now see Jesus, but they can and must see Jesus in you.